It's only us lucky folks who decorate their front porch with a discarded sink. And a roll of gross linoleum. Mostly it's progress in the planning department, but progress none-the-less. 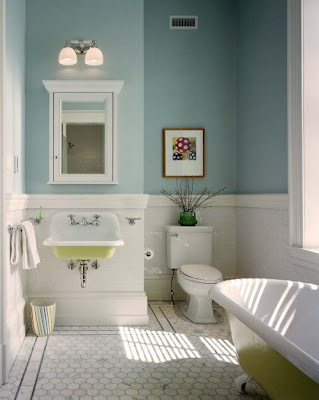 This project was started so spur-of-the-moment that I hadn't really thought about what I'd like to see in a bathroom.......besides a closed toilet lid and towels off the floor. So I've been scouring Pinterest and trying to find a style that appeals. I love pedestal sinks. They're classic and timeless, but probably unrealistic for this work-horse of a bathroom. We need storage and counter space. 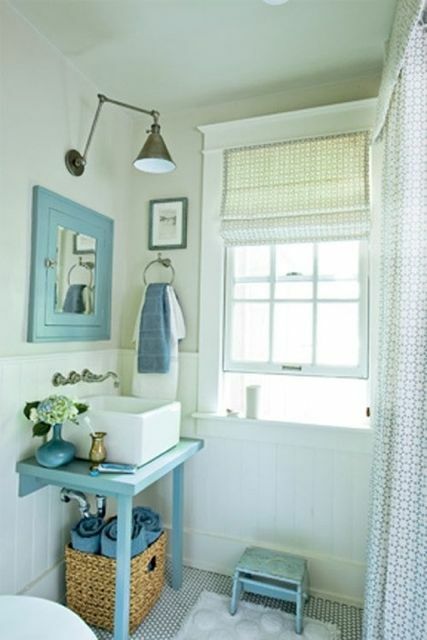 As much as I adore this bathroom, where is the blow dryer going? Where do you set your makeup? 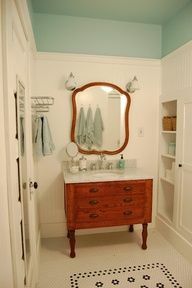 We found a beautiful antique cabinet that could accommodate a vessel sink, which I love, but would I love it in reality? 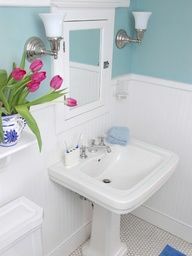 Because in reality, there would be toothpaste spit down the front of that gorgeous vessel sink onto the beautiful wood countertop, which probably isn't very easy to clean. Now something like this might fit the bill. 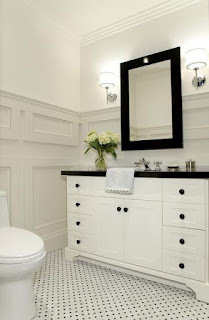 The built-ins are gorgeous and the vanity is stunning. The marble countertop is timeless. I know we need storage and as much of it as we can cram into this teeny bathroom, but I don't want the boxy vanities that I'm finding in the stores. So, it looks like Lyle's building a custom piece. It will have storage that can be hidden away, but hopefully have a furniture look. We've ordered the countertop--a gray-flecked granite and are trying to think through our kid's morning and nighttime routines to help with order and cleanliness. There will be a built-in cubby for Sonicare Toothbrushes, so they can be off the counter (in theory). 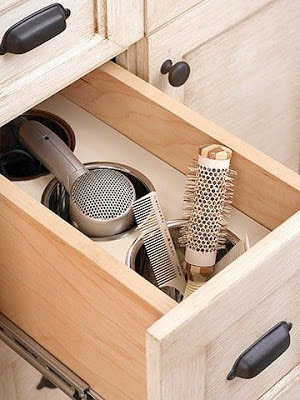 There will be a pull-out drawer of some sort for blow dryers and straighteners, already plugged in, so you just have to remove them from the drawers, use them, and put them back (in theory). the toilet lid will not close itself and the towels won't put themselves back on the rack. We do what we can. They're good theories. Good luck! The family vernacular for tidbits of food left on a plate after a meal, as in, "I'll give my scravings to Charlie," or "I CAN have dessert. This is just scravings." It seemed an appropriate word for the little morsels thrown out on our blog. Sometimes tasty, sometimes destined for the dog dish. Bruder--on a mission to Texas! Injuries? Maybe. But it's tradition.